You know how you walk into a grocery store and find yourself buying food at the end of the aisle? Or why candy is located at child-eye level by the checkout counter? Foods that are easy to spot and presented well are not put there by accident, and food companies pay for the privilege. The secret is “choice architecture,” a term for different ways in which choices can be presented to consumers, and the impact of that presentation on consumer decision making. For example, the number of choices presented,‪ the manner in which attributes are described, and the presence of a “default”‪ can all influence consumer choice. Richard Thaler and Cass Sunstein write about this in their book, Nudge: Improving Decisions about Health, Wealth, and Happiness (which I highly recommend). Nutritionist Junelle Lupiani recommends putting healthy food in glass containers (and placing them prominently on the table or in a refrigerator). Studies have shown that people are much more likely to eat food in a glass container over food in something you can’t see through. Google has implemented this strategy in many of their break areas by storing the candy in opaque containers and displaying healthier snacks, such as pistachios, in glass jars. They also have started putting their own nutrition labels on foods so that Googlers are highly aware of the food choices they are making. Some companies also use glass doors on their refrigerators, to remind employees of the healthy food options inside (versus processed snacks that do not require refrigeration). Brian Wansink, director of Cornell University’s Food and Brand Lab, and author of Mindless Eating: Why We Eat More Than We Think, suggests a number of ways our eating behavior is significantly impacted by they way food is presented to us. For example, in some of his studies, people were likely to snack less (44 percent less) in kitchens that were tidy vs. kitchen environments that were cluttered with paper, dirty dishes, etc. So keeping the kitchen clean is more than just a sanitation issue, it can affect how much we eat! In another study, he found that people were more likely to eat less on plates that are 9-10 inches in diameter. 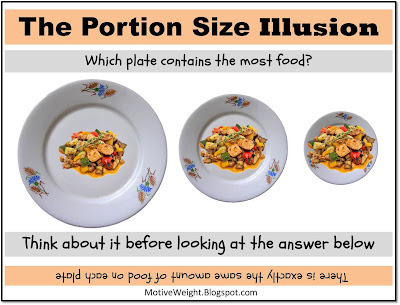 People tended to pile up food on plates that were larger, and felt “deprived” and go for a second helping when eating on smaller plates (say, 6 inches in diameter). Other studies of his show that people are likely to serve themselves 20 percent less food on plates with “contrasting colors” to the food they are eating such as white pasta on a red or blue plate. Since many of us tend to eat a lot of carbohydrates, white plates will likely increase our consumption over those with darker colors – white on white is just harder to see. Many companies I’ve interviewed are using choice architecture by reducing the number of unhealthy foods from the workplace, or by making them harder to find. This is effective, but it’s also important to continue to provide food choices for a variety of tastes. People love choice and diversity in their diet just as they always have for generations. If companies get too draconian with choice architecture, it can feel a coercive and not have the desired effect. The best way to go about this is to have a licensed dietician survey your population, make recommendations on what foods to provide, as well as how to prepare and display them.